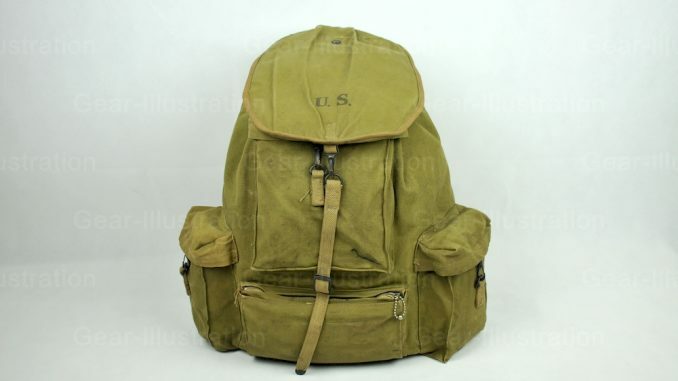 U.S. Army developed and adopted its first rucksack during the summer of 1941. The canvas duck sack was mounted on a steel wire or rattan frame that supported the load and held it off the soldier’s back. Four pockets on the outside of the bag carried extra gear. Heavy felt pads on both the back support and the shoulder straps eased the burden. Brass snap hooks closed the three side pockets and the cover flap, the pocket on the front bottom is zipper closed. The 1941 pattern rucksacks were made during late 1941 and into early 1942. Being based on a typical commercial rucksack (Norwegian Bergens), this first army rucksack was poorly suited for military use. The National Ski Association’s Winter Equipment Committee reviewed the rucksack at the War Department’s request and suggested twelve improvements that the QMC then incorporated into the next generation rucksack. With the adoption of the Specification J.Q.D. 88 rucksack, the Army withdrew the 1941 pattern from service.